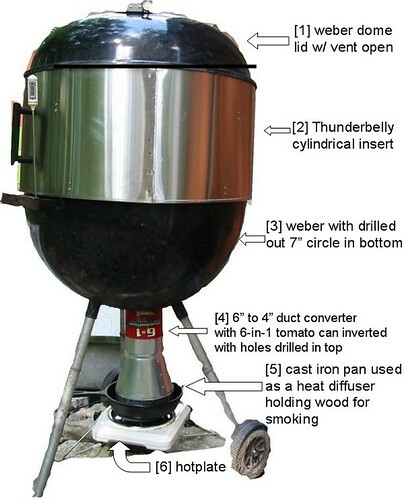 In my previous version of the Weber mod, I was essentially cooking, not smoking since my dome temperature was 150-deg-F. Since then I made the several changes. I'll point out all the features of the new version and indicate which are alterations to the old one. 1. Dome, no change here. Just a thermometer inserted to monitor the temperature near the food. 2. The Thunderbelly insert (caution: most horribly designed site in the world with loud music), used, as before, to position food further from the heat/smoke source. 3. The drilled out bottom to permit the smoke into the Weber kettle, no change. d. the smoldering wood will last much longer (a ca. 2.5" cube smoldered about 6 hours). 5. Using my chimney/smoke conduit on top of a cast iron pan greatly reduced the dome temperature. The cast iron pan got really hot, but since the heat is essentially outside the system, it dissipates into the environment much better than the previous version. On a 80-deg-F day with no wind, I was able to keep the dome temperature at a steady 105-deg-F to 110-deg-F. Still on the high end of cold smoking, but on a cooler day, with a light breeze, this may be perfect for a 24 hour period of smoking, perfect for salmon or trout. 6. 650 W hotplate set on M, no change. This was just a dry run with no food in the chamber. I have a couple more ideas to implement before a food run. Keep you posted.